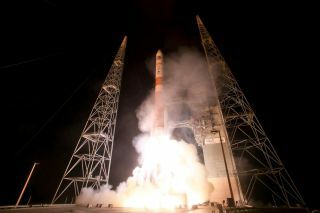 A United Launch Alliance-built Delta IV rocket launches the sixth Wideband Global Satcom (WGS) satellite Aug. 7, 2013 from Space Launch Complex 37B at Cape Canaveral Air Force Station in Florida. The WGS system provides anytime, anywhere communication for the warfighter through broadcast, multicast and point-to-point connections. No matter where you look in the air, outer space and within the depths of cyberspace, these are congested, contested and competitive environments. A recently released U.S. Air Force study scopes out a science and technology vision to deal with these concerns. At its heart, a new report, titled "Global Horizons," strives to take advantage of $1.4 trillion in worldwide research and development investments to protect the Air Force's global missions. Those missions involve operating in, from and through the global domains of air, space and cyberspace — all geared to support America's security interests. But times are tight, dollar-wise. How best to make investments near-term and into the future? From 2010 to June 2013, Mark Maybury served as the chief scientist of the Air Force, providing assessments on a wide range of scientific and technical issues affecting the U.S. Air Force mission. During his Air Force tenure, Maybury carried out strategic studies in energy, cybersecurity, and global science and technology. One of those studies was "Global Horizons," which was released in late June. In the report's foreword, Maybury explains that the findings in "Global Horizons" use "the best known information to quantify a complex, competitive and contested future." Maybury also underscores his wish that "Global Horizons" can help ensure the Air Force's ability to fly, fight and win in air, space and cyberspace. In the realm of space, "Global Horizons" provides a far-reaching, if not jittery, assessment of today, and things to come. The report explains that challenges to the U.S. space advantage are being developed and proliferated worldwide. Technology to jam communications and Global Positioning System (GPS) positioning, navigation and timing satellites will become pervasive. What's more, the ability to disrupt intelligence, surveillance and reconnaissance operations will become more prevalent over the next decade. Also, attribution and locating threats will remain a challenge, according to the report. In several areas of the report, the budding role of directed-energy weapons (DEW) is discussed. These high-powered lasers and microwaves could disrupt or prevent air, space and cyber operations. Advances in research and development will accelerate the development and deployment of DEWs by U.S. adversaries in coming years, experts say. Advances in efficiencies, power levels, thermal management and optics could make directed energy weaponry a "game-changing" technology soon. With the worldwide proliferation of space launch capabilities and small satellites, space is becoming increasingly congested, contested and competitive. A major trend is that virtually any country can procure launch services and easily access space. An example of space congestion is the increasing amount of debris, consisting of tens of thousands of objects sized 10 centimeters (4 inches) or greater, with an estimated 100 million objects smaller than that. In the past 10 years, the number of objects tracked has grown by a third. Contested space is illustrated by the increasing vulnerability of U.S. high-value space assets due to growing cyberthreats and physical threats. The overloaded electromagnetic communications spectrum, both in the U.S. and internationally, reflects the competitiveness of space. The United States must move to increasingly higher frequencies (V-band, W-band, laser communications) in order to avoid the allocation difficulties present at all lower frequencies. "Global Horizons" observes that there are "clear threats to the U.S. space enterprise," including increased amounts of space debris, space weather induced upsets, the increasingly easy access to space and potential cyber/electronic warfare/kinetic attacks on U.S. space and space-support ground assets. However, these threats present opportunities for the Air Force to revamp the way it provides space services, experts say. For example, the contested space issues (cyber, the electromagnetic spectrum) are opportunities for international cooperation to improve GPS satellite accuracy, develop protocols for cybercooperation, and open up new electromagnetic spectrum for communications and control. Make use of numbers of smaller spacecraft to complement few, very large and highly capable legacy satellites to provide resilience, reduce vulnerability, and balance performance and cost effectiveness. Develop a small/low-cost launch ability to loft smaller satellites more cheaply. The small, low-cost launch capability being developed by the commercial industry provides a new paradigm for accessing space. Press forward on new technologies, such as 3D printing in space (enabling construction and repair in orbit), a way forward to help realize low-cost satellites, and agile, reconfigurable space systems. Autonomous space systems and ground control would revolutionize space operations. But the biggest impact would come from increasing satellite power, persistence and survivability to conduct intelligence-gathering, surveillance and reconnaissance and other traditional air missions from the relative sanctuary of space. Wanted: a re-energized prototype program. The Air Force can learn from industry, such as Scaled Composites, builder of the WhiteKnightTwo/SpaceShipTwo launch system for Virgin Galactic, and the rocket company SpaceX. Both have successfully demonstrated novel architectures and rapid prototyping processes to yield aerospace vehicles 50 percent faster compared to traditional development processes. One futuristic game changer spotlighted in the report is "cold-atom-based navigation." This capability may well provide precisions many orders of magnitude greater than what can be achieved with the current laser-based navigation. Cold-atom-based navigation is currently at the applied research level. This technology would use cold atoms to create atomic clocks for extremely precise timing for use in navigation. Cold-atom clocks on a chip is a key technology for smaller and less-stable spacecraft, the report explains, such as on ballistic missiles, satellites and small unmanned vehicles. In its closing pages, the "Global Horizons" report stresses the need to sustain and assure America's "global advantage" in future major military conflict. "'Global Horizons' provides a critical element of our path to success in peacetime, during humanitarian and disaster relief, or in military conflict," the report concludes. You can view the report via Air Force Magazine's website here.